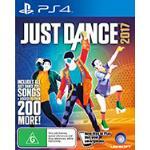 Just Dance 2017 (PS4) Expert Reviews - Read Reviews and Buy Smarter Online. Verdict: At PAX Australia, I had to opportunity to try out Just Dance 17, the latest instalment in the Just Dance series. When I say opportunity, I really mean that I went to seek out these booths so I could play the game. Verdict: If your having a party, this is always good fun later in the night, a good way to make everyone look foolish! Good workout for kids....and adults too. Verdict: My kids love this game and it's good exercise for those coach potatoes. Verdict: I love the songs, but I hate this version of Just Dance. I bought the 2016 on Xbox1 and never had a problem with the songs registering my moves. On this one it has a big X to say I'm not even in the room half the time I'm dancing. Verdict: Brought this for my 5 and 6 year old girls... to say they love it is an understatement! Verdict: This is sooo much fun. You look ridiculous, but sweaty at every turn. great game, great exercise. We dance at least 3 songs every night at home and the whole family joins. Verdict: Bought for children as a Christmas gift, some of the moves for the 6 year old are quite complex but it's good fun. Nice to get a game that everyone can join in with.